Day 2 of quotes tag! Okay, it’s much harder to pick from the quotes I love than it seems. I have so much saved! Anyway, thanks to Confessions of a Literary Addict for the tag! I think this is where Elend won me over entirely. I wasn’t such a big fan, to be honest, because I never saw him as a particularly interesting character. Even his friends seemed more intriguing, with their radical ideas and philosophical talk. Still, Elend is one of my favorite characters ever, and mostly because he’s the type of bookworm I can relate to. 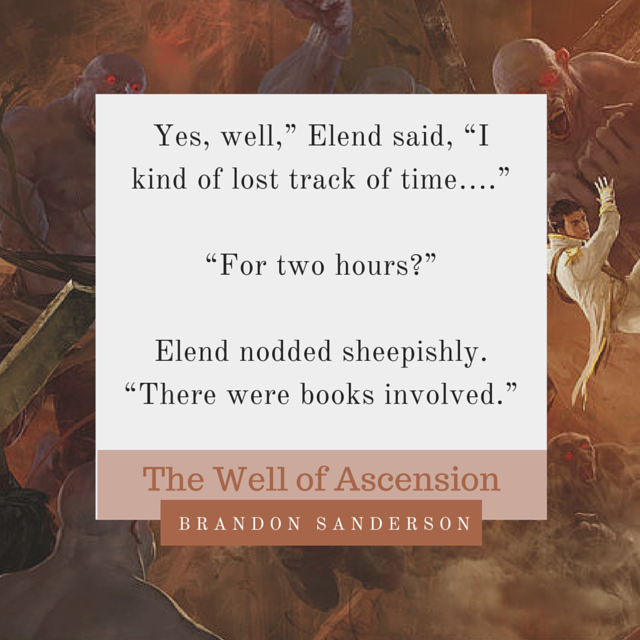 I’ve often found myself losing track of time when books are involved, so this conversation between a late Elend and an incredulous Breeze made me chortle much in the book.